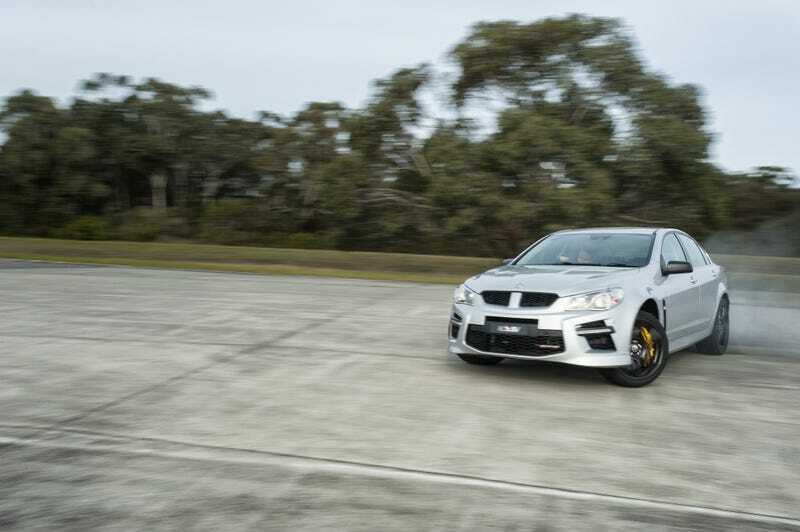 The demise of Holden may be ensured but it's legacy will live on at least a little longer in another of GM's endeavors abroad— the Vauxhall VXR8 GTS super sedan aimed squarely at the M5 and E63 AMG. The VXR8 GTS is an elaboration on Holden's beastly Gen-F GTS, adding a new Eaton supercharger good for an additional 150hp over the outgoing model. GM's calling this Vauxhall "the most powerful production car ever to emerge from Australia" though it should be noted the Vauxhall has been designated for sale in the UK. The boosted 6.2 LSA V8 is now good for 576bhp and 545lb ft of torque, and though performance figures have yet to be released it's £54,999 (about $90,000) MSRP make it the cheapest ticket to the 500 factory horsepower club in jolly old England. Here in the US we get the naturally aspirated and decidedly more conservative looking Chevrolet version— the SS. But if you're clever and have access to GM UK's parts catalogue, you just might be able to borrow the blower and beef your bowtie up to the VXR8 GTS level. GM's hoping to bully the more expensive M and AMG rivals with more horsepower, a meaner face, and what I'm sure will be a riotous exhaust note... not to mention a significantly lower price. Vauxhall has stepped up their game with tech as well, with a host of crash-alerts and g-force gauge presented in an HUD. While the VXR8 GTS may lack the refinement of the Germans, part of me thinks that's how Holden would have wanted it. This car is sure to be a screamer and an honor to Holden's heritage of hooning.